I have attached some JPEG photos of models I have made using your outstanding decals. They are the 2000 #45 Sprint Chevy driven by Adam Petty in his only WC start, the 1998 #43 STP Pontiac driven in the fire-postponed Daytona Pepsi 400 by John Andretti, Dale Earnhardt's 1998 Daytona 500 winner, and the #43 STP Pontiac driven by by brother Gary at the Richard Petty Driving Experience at Walt Disney World in 2001. I must make special mention of the #43 WDW car and the #3 car. I was able to photograph both cars for reference (the Goodwrench Daytona winner was on display at Daytona USA for a year) and did a bit of modifications based on these references. While I was able to use the Slixx sheet for the #3 in its entirety (and a great sheet it was!) 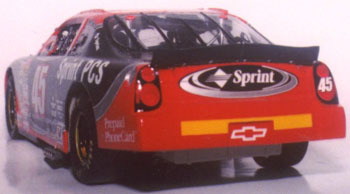 I had to "sheet-bash" the #43 car from the sheets for the early 2000 and 1999 schemes, as well as using various "goodie sheets". You may note the WDW #43 doesn't have Goodyear Eagle markings on the tires -- neither did the actual car. I am submitting more extensive building and photo information to Scale Auto Enthusiast for their Readers' Gallery. All photos are by Russell Mitchell. Thanks for making such wonderful decals!